Expanding your network can have obvious personal and professional benefits. The expansion of social media and the widening of the app landscape have made coming together to enhance your connections easier than ever before. At the intersection of physical space and networking technology is coworking, which as a movement has helped bring diverse professionals together to work in an atmosphere that encourages the sharing of ideas. By widening your potential networking pool to goal-achieving and driven entrepreneurs and business owners- doors are opened for everything from collaboration, to inspiration. Social events are ever present at each of our locations to give clients a chance to break out of the office routine and meet their AdvantEdge neighbors. These gatherings are often centered around different seasonal themes, but with each occasion bring another chance to enhance connections within the AdvantEdge community. 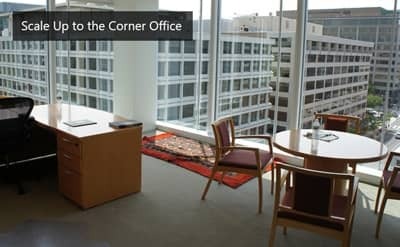 More than the space itself, networking in this type of atmosphere is about providing all of the intangible benefits that come with developing strategic partnerships or cultivating new clients. Proximity to other professionals on a daily basis is another, less structured opportunity to expand your reach. Water cooler talk can turn from the craziest outfits at the VMA’s (We’re looking at you Miley Cyrus) to how their programming skills and help enhance your latest business concept. The diversity of clients across a number of industries ensures that whether or not you have a direct opportunity with someone else in the office, you are still expanding your horizons and making connections that can prove useful down the road. This cross-pollination of ideas is unique to shared workspaces and coworking, and is just one of the ways that modern workspace is being revolutionized to the benefit of its users. With the rapidly increasing pace of innovation, and the ever growing resources available in a competitive landscape, businesses simply can’t afford to not collaborate. Coworking simplifies this process with a host of events, community space, and even just a shared kitchen. 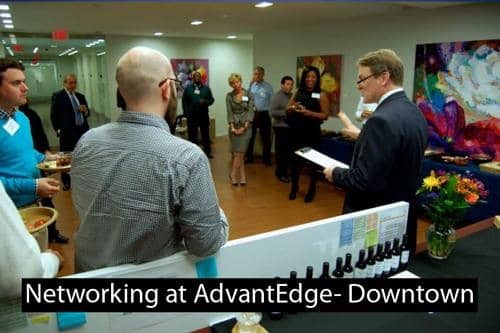 If you’ve not yet considered the coworking environment for growing your business, click below to see more of how AdvantEdge can help you grow!